It was written, in some cases the amount of absorption reactions is dramatically reduced despite the unchanged microscopic cross-section of the material. This phenomena is commonly known as the resonance self-shielding and also contributes to to the reactor stability. There are two types of self-shielding. In each nuclear reactor, there is a characteristic neutron energy spectrum that, in case of thermal reactors, covers also the resonance region of various materials (238U is of importance in this phenomenon). The vicinity of the resonance causes an increase in the neutron absorption probability, when a neutron have an energy near a resonance. This results in a reduction of the effective absorption per nucleus due to the depression of the energy dependent flux Φ(E) near the resonance in comparison to a flat flux. At energies just below the resonance, where σa (E) becomes small again, the neutron flux reaches almost to the same value just above the resonance. This reduction in the energy dependent neutron flux near the resonance energy is known as energy self-shielding. 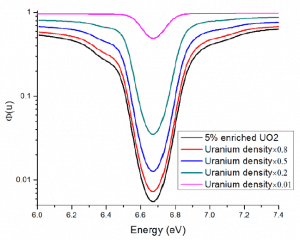 For neutron absorption reaction on 238U the first resonance corresponds to the excitation energy of 6.67eV. The width of this resonance is about ∆E=0.027eV, which absorbs about 4% of the neutrons slowing down past the resonance energy. 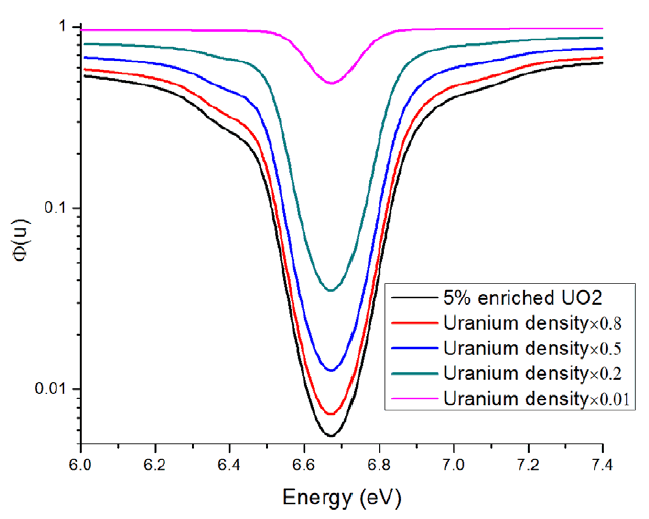 Energy dependent neutron flux versus uranium density at 6.67eV resonance of 238U. Energy dependent neutron flux versus fuel temperature at 6.67eV resonance of 238U. The basic fuel element of light water reactors is a fuel rod which contains fuel pellets made of uranium dioxide. 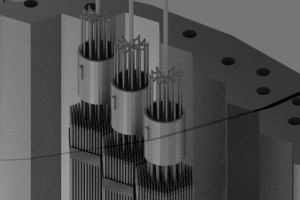 For example, an 1100 MWe (3300 MWth) reactor core may contain 157 fuel assemblies composed of over 45,000 fuel rods and some 15 million fuel pellets. The neutron moderator surrounds these fuel rods. The spatial self-shielding is phenomenon primarily connected with this heterogeneity of the reactor core. 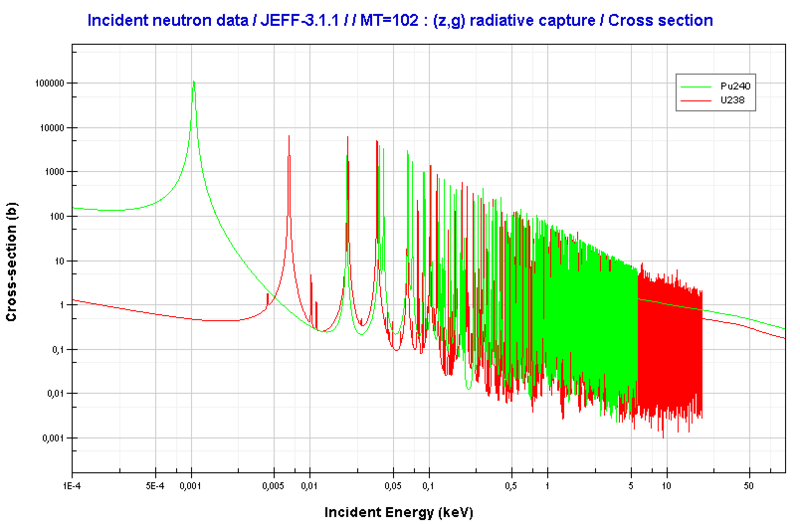 The fission neutrons are born in the fuel, but they are primarily moderated (slowed down) in the moderator. Thermal and epithermal neutrons return back into the fuel to be absorbed and to cause further fission. With the aid of energy self-shielding neutrons are more likely absorbed by the nuclei near the fuel surface. In this case the surface layers of the fuel geometrically shields the inner layers from neutron flux, leading to a relatively lower neutron flux inside the fuel rod. 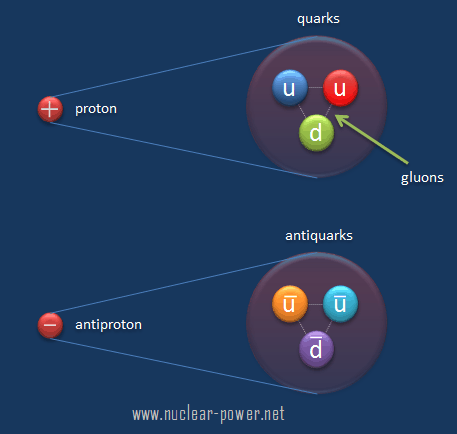 For neutron energies near resonances (energy self-shielding) the depression of the energy dependent flux is dramatical. 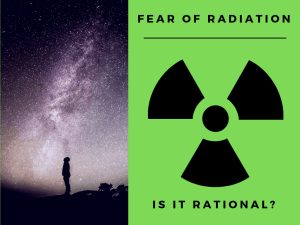 The spatial and energy self-shielding, that take place primarily in heterogeneous reactor cores, causes a significant increase in the resonance escape probability (“p” from four factor formula) in comparison with homogeneous cores. Without the spatial self-shielding provided by the separation of fuel and moderator, values of keff = 1 are possible with natural uranium fuel only if heavy water is used as the moderator. 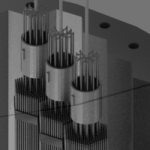 In nuclear industry gadolinium is commonly used as a neutron absorber due to the very high neutron absorbtion cross-section of two isotopes 155Gd and 157Gd. In fact their absorption cross-sections are the highest among all stable isotopes. 155Gd has 61 000 barns for thermal neutrons (for 0.025 eV neutron) and 157Gd has even 254 000 barns. 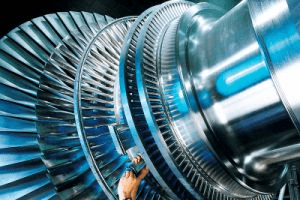 Some power plants use gadolinium as a burnable absorber diluted in the fuel matrix in the form of mixture Gd2O3 + UO2. Such the high absorption cross-section of gadolinium causes that the fuel rod is burning up layer by layer (from the surface to inner layers) and at the beginning of the cycle this fuel rod behaves like being from neutron black material. At the beginning of the cycle the higher content (i.e. from 4% to 6% of Gd2O3) of gadolinium causes minimal decrease in the overall compensation of the core reactivity. Only the higher amount of such rods with burnable absorber results in the overall decrease in core reactivity. This is also the example of very strong effect of self-shielding. There is a further phenomenon connected with spatial and energy self-shielding. 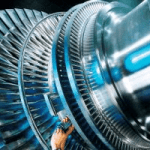 The energy self-shielding is significantly affected by the material temperature. 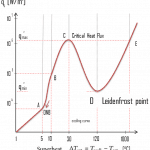 It is closely connected with the Doppler broadening and with the fuel temperature coefficient (also known as the Doppler coefficient). 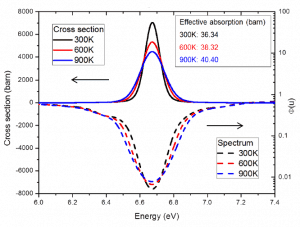 The material temperature affects the energy self-shielding through Doppler-broadening of the microscopic resonance cross-section. 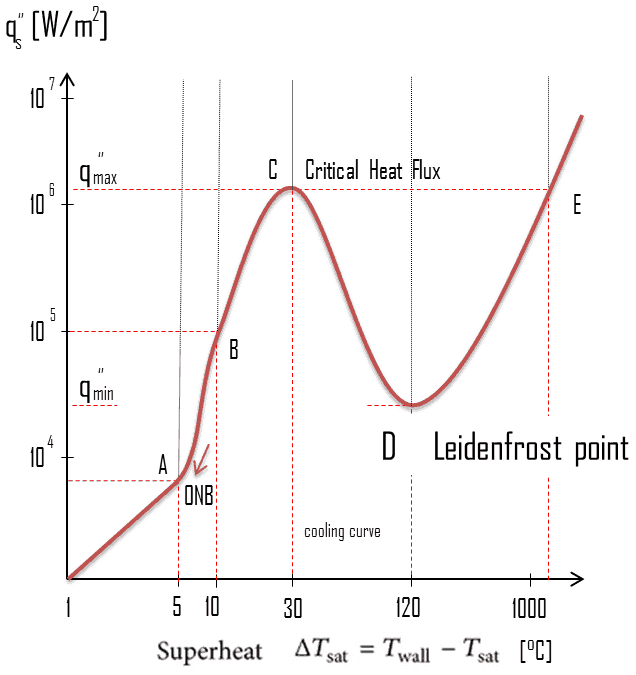 With an increase in fuel temperature also the thermal motion of target nuclei increases resulting in the broadening of spectral lines due to the Doppler effect. The wings of resonances are broadened while its peak magnitude decreases. 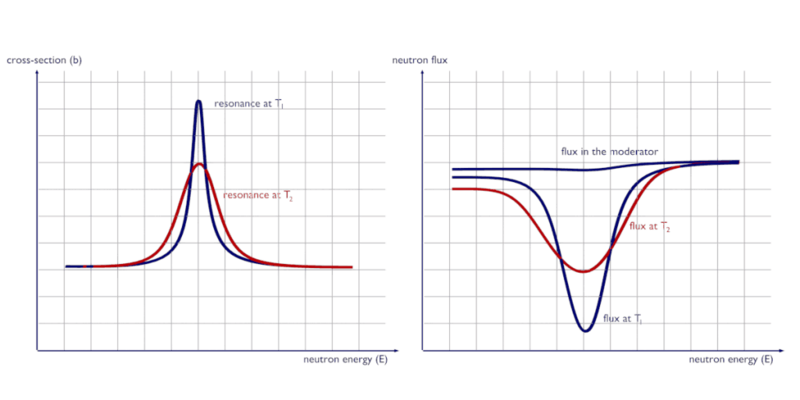 The energy dependent neutron flux closely follow the behavior of the changed resonances in a reverse manner, leading to a reduction in the self-shielding and an increase in the effective microscopic absorption cross-section. This in turn provides negative reactivity feedback against fuel temperature increase. An increase in temperature from T1 to T2 causes the broadening of spectral lines of resonances. 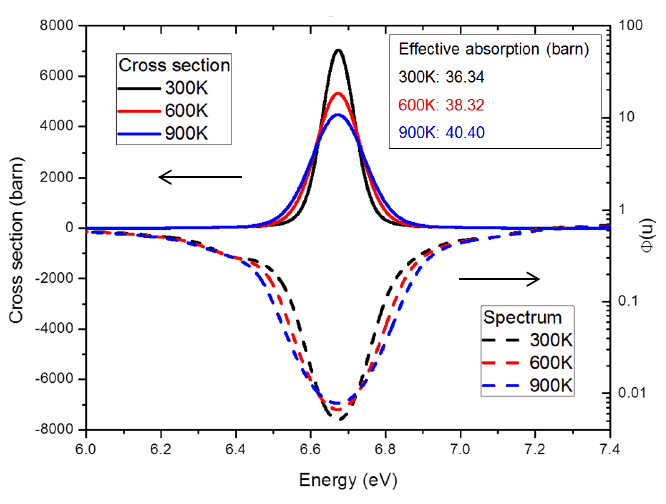 Although the area under the resonance remains the same, the broadening of spectral lines causes an increase in neutron flux in the fuel φf(E), which in turn increases the absorption as the temperature increases.